Nana Lou – Here’s lookin’ at you. Hi I’m Nana Lou. (@NanaLou022) The matriarch of the family, although Bossy is well on her way to taking over that family role. It will be my 100th birthday this year, and the Burgeron family has gathered for a family reunion at the old Burgeron place. The family tree is something you wouldn’t believe – more like a family jungle if you ask me. We’re a diverse family, spread out over the globe. We’ve seen and been through a lot over the generations, and I’ve got one final big surprise for everyone. But they’ll have to wait until my big blow-out birthday on August 31st to find out what it is. In getting prepared for this event we decided we should have our very own website. The conspiracy theorists among the family absolutely refused to use the conventional social networking platforms like Facebook. No way were they going to have somebody eavesdropping and selling their information to advertisers. By God, they would be in charge of their own digital identity. Right from the start we had other issues come up like the person we hired to procure our domain name misspelled Burgeron, by substituting the “u” with an “e” and signing us up for “TheBergerons” instead. Now we’re getting confused with the real Bergeron family whose massive presence on the web overshadows anything we could do. Then there was the issue of digital literacy in general among family members. Some know there way around a hard drive like nobody’s business, others think a hard drive is when you have to haul the dog and kids across country in the old car with 4-60 air conditioning (4 windows rolled down going 60 miles an hour.) to attend some cockamamy family reunion in Bovine County, Texas. Enroll in a computer class where they learn to use computers, social media and digital tools. Demonstrate they have learned well by publishing their work and process on-line. This website will chronicle that learning and our Burgeron family history for future generations. Thought I’d post a few recent pics of the crazy ol’ lady. I’m quite the wild one still. Even though they won’t let that “incident” from my distant past go, I’m still out there supervising the youngin’s making our famous Burgeron Backyard Brew. 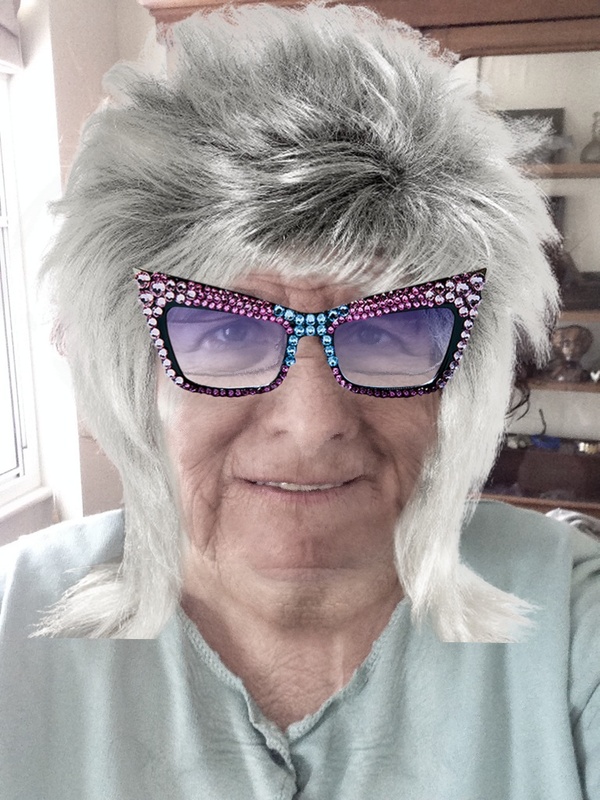 Kind of like Dame Edna Everage?? Yes, Edna and I have a lot in common when it comes to fashion sense. I remember well having my baby sister studying my every move as I would dress in the morning during her visits. At times she’d even help out by choosing a part of my outfit. Hi! Shouldn’t ‘Sappho; be listed as a nephew and niece? as she is Don’s sister? ?